The LFM Academy focuses on promoting organizational coherence within each college through the integration and coordination of college programs including equity, student success, basic skills, and professional development. California Community Colleges need strong, innovative “middle” leaders — faculty, department chairs, directors, deans, student services professionals, researchers, classified staff — who can effectively respond to the myriad of reforms facing our institutions, facilitate communication, and move stakeholders to action. The RP Group is working to develop this group of critical change makers through our Leading from the Middle (LFM) Academy. Prior to becoming a “formal” educator, Ireri taught English to low-income Latino and South East Asian immigrants in the Central Valley. Inspired by her students’ resilience and witnessing the impact education had on their lives, Ireri returned to school and got a masters in Adult Education from SFSU. Ireri started her education career designing, implementing, and leading adult basic education and workplace education programs for homeless and formerly homeless adults in San Francisco. Later in her career, she worked at California Tomorrow where she developed and lead the Campus Change Network (CCN) which focused on working with California Community College practitioners seeking to address equity issues on their campuses by leading systems change efforts. Kristina Whalen’s first joined LFM as a participant with her City College of SF team and recently became an LFM coach. In this latter role, Kristina worked with other like-minded faculty leaders to further institutionalize a standard process for reporting assessment while validating the necessity of varied and multiple methods of collecting assessment data. She and her team also worked closely with the CCSF Research and Planning Office in order to inform and support the college’s assessment and equity goals. In addition to these roles, Kristina Whalen has served as Chair of the Student Preparation and Success Committee; on two accreditation self-study teams; and as a member of the Accreditation Steering and Professional Development Committee. Currently, she is the Dean of Fine, Applied and Communication Arts at CCSF, guiding support for 10 departments and the Fort Mason Art Campus. District-wide, she works on the launch of a Maker Space, on the introduction of a campus-wide Early Alert system, and with Basic Skills Initiative coordinators. Rose Asera has also served as director of the Carnegie Foundation’s community college project, Strengthening Pre-collegiate Education in Community College (SPECC), which was a powerful incubator for segments of present day community college work and has been responsible for nurturing a number of campus and statewide leaders. Across her career, Rose has been a leader from the middle, side, and back. While she steps to the front when the need arises, she prefers to provide support from behind the curtain. She has also been a member of her Academic Senate, has attended the State Senate Leadership Institute; and has led the development of a a training program for new full-time faculty. She has also served as the District Enrollment Management Representative for Norco College in her multi-college district; is the current Chair of Chairs, and is the current Institutional Strategic Planning Council Co-Chair for her college. Melissa’s work with her LFM team helped establish the meta-majors and initial pathways for Norco College, and she is now co-chairing Norco College’s Competition Initiative and the Norco California Pathways Initiative workgroup. In addition to helping develop a nationally-recognized summer bridge program focused on appropriate placement in English and math, Melissa has played an integral role in the effective onboarding of incoming first-year students. Quinton Bemiller participated in the 2018 LFM Academy, and joined the LFM coaching team in 2019. With his Norco College colleagues, he designed a comprehensive strategic plan for professional development, aligned with Guided Pathways. At Norco College, he has served as Department Chair of Art, Humanities, Philosophy and World Languages, and as Chair of the Teaching and Learning Committee. Quinton has been actively involved with the Academic Senate, Guided Pathways, Accreditation, Curriculum, Program Review, Assessment, and Equity work at his college. He is an Associate Professor of Art/Art History, and is Director of the Norco College Art Gallery. Quinton is a doctoral candidate at California State University, San Bernardino, currently completing an EdD in Higher Education/Community College Leadership, with an emphasis on Social Justice. His research focuses on community college faculty leaders and their experiences while transitioning into administrative roles. During her time as CCSF’s Professional Development Coordinator, she led several efforts including; researching and implementing best professional development practices, creating a Professional Development Committee, creating a Professional Development Plan, and implementing online flex reporting on her campus. Currently, she is the Department Chair of the CCSF English Department, where she has led efforts to rebuild the department’s pre-collegiate English sequence, which included a full revamp of the English Placement Test and integration of multiple measures as part of that placement system. Through pure happenstance, Reagen has worked for all three public college/university systems in California. Reagen is a middle child with six brothers and sisters. She has two dogs (one is a German Shepherd mix and the other is a Shih Tzu and Poodle mix) named Yoshi and Marshmallow. Reagan’s passion is working with at-risk youth and she volunteer’s her services to assist with the Girl Power Conference at CSUB each year. Reagen enjoys museums, traveling, and musicals. Reagan first participated in LFM in 2018 as a member of Porterville College’s LFM team. In 2019, she will continue her involvement with LFM by moving into a coaching role and joining the LFM coaching team. Vicki’s role as an education leader began in the late 1970's as the coordinator of substance abuse education and prevention for the Guam Department of Education. After graduate school she was the Assistant Director of the Program on Conflict Resolution at the University of Hawaii Manoa for several years. When she returned to teaching in California, she led a 5-year program planning process for the San Jose State University Communications Department. Vicki has been at Cabrillo Community College since 2000 and during that time has participated in many college initiatives and committees. A few specific roles include: faculty Union Executive Board Member, Union Vice-President, Academy of College Excellence Director and Master Mentor trainer, faculty senate representative, faculty student-success and equity Coordinator. Currently, she is the Department Chair of the Communication Studies Department. He is currently a Senior Research Analyst, serving on a variety of committees, from shared governance to curriculum to Institutional Review Board (IRB) to CSEA’ E-Board, and works on a variety of initiatives, such as learning communities, MMAP, and guided pathways. Outside of community college life, Luis has participated in various leadership institutes in and out of the Central Valley and currently sits on several boards, advocating for and committing to community-oriented social justice, including Valley Land Alliance (VLA), a non-profit promoting ag land and open space preservation in Merced County. He is a graduate of UC Berkeley and the Graduate School of Education at the University of Pennsylvania. Luis, a proud cachanilla, enjoys slow food, Latin American art and community organizing/activism. Robert Gabriner is one of the founders of Leading from the Middle; an RP Group program established in 2013. He currently serves as the program’s Director. As an educator for 21 years, he taught at several community colleges and has served as executive secretary of the Peralta Federation of Teachers; the president of the Community College Council of the California Federation of Teachers; as the Dean of Research, Planning, and Grants at City College of San Francisco; as Vice Chancellor of CCSF and the Director of the Educational Leadership Doctoral Program at San Francisco State University from 2009 to 2016. Since the 1990s Robert Gabriner has provided key leadership to the RP Group, including founding the RP Group’s Center for Student Success, a key source for statewide research on student success in California Community Colleges. As one of the architects of the Community College Reform Act of 1988, he also served on statewide task forces that became the foundation for the 2004 Community College Accountability Act and the 2012 Student Success Act. Vandana Gavaskar began her participation in LFM in 2017. Currently, she is a Director for a Title V grant at Santa Barbara City College focused on creating pathways for part-time students. She has also served as full-time faculty at three other post-secondary institutions. During her career, she has developed and participated in programs for student success in partnership with campus, statewide and national initiatives focused on equity and cultural diversity. She continues to lead workshops for various professional organizations and has also helped to develop a Center for Academic Excellence for a consortium of Historically Black Colleges and Universities. During her community college career, Chris Hill has served in faculty leadership including serving as Academic Senate president, and in administrative positions spanning both instruction and student services — all of which helps her bring a broad, student-focused perspective to her work. Her methods include engaging faculty, classified staff, administrators and students in meaningful discussions on how the college can improve processes and/or alter approaches; and by coalescing the ideas generated into a coherent plan for implementation and evaluation. Jennifer Johnson began her participation in LFM in 2018 as a member of the Bakersfield College team participating in the first academy developed specifically for Central Valley Colleges. She joined the LFM coaching team in 2019. Currently, she is serving in both local and state leadership roles including the BC Department Chair for Nursing, faculty Co-Chair of the BC Curriculum Committee, faculty member of the BC Guided Pathways Implementation Team, member of the ASCCC legislative committee, and is an ASCCC appointed member to the California Community Colleges Curriculum Committee (5C). Her engagement at the varied levels of governance represents her commitment to understanding and improving systems that will enhance a student’s educational experience. As Department Chair of the Nursing Department, she has developed mentoring and support systems for new nursing faculty and has developed a departmental early alert process for nursing students. In 2014, she began her first administrator position as Associate Dean of Noncredit & Continuing Education at Pasadena City College, then moved to Rio Hondo College where she has served as Dean of Communications and Languages since 2016. In partnership with the LFM director, Alice launched the LFM leadership listserve in fall 2018 and is the current listserve moderator. She joined the Leading from the Middle coaching team in 2019. Brent first began his affiliation with Leading from the Middle (LFM) as a participant, and felt that what he and his team learned from the Institute directly led to their progress and success in implementing Guided Pathways at IVC. When the opportunity arose to share his knowledge and experience as a coach to other LFM attendees, Brent became a member of the LFM team without hesitation. He also serves on the North County Higher Education Alliance where collaborative intersegmental efforts are designed and implemented to address cohesive emerging priorities for the North County of San Diego. Ben serves as a Senator for the local Faculty Senate and also serves as a faculty appointed representative for the California Community College Chancellor’s Office Credit for Prior Learning Advisory Committee. In his spare time, Ben enjoys running, ocean canoeing, and spending time at the beach. A product of the community colleges, he is most interested in improving instruction to transform the lives of marginalized populations. Vanson joined the Leading from the Middle coaching team in 2019. Furthermore, Margery was a member of the Cabrillo College LFM team which helped bring both an equity and Guided Pathways impetus back to the college. The fruits of the team’s efforts can be seen in the current work happening at the college to identify and implement change. Prior to working at Cabrillo, Margery held positions at Santa Clara University, Planned Parenthood, and Gavilan College. At Gavilan, her work included teaching, counseling, and serving as Faculty Senate President. While at Planned Parenthood Margery was involved in training and program design. Margery’s decades of work have always included mentoring, coaching, and advocacy for women and Chicano/a/Latinx faculty, staff and students. Finally, her doctoral dissertation from the Fielding Graduate University in Santa Barbara was focused on leadership, organizational change, and strategies staff use to influence change –both in support of and against it. He served as the chair of the English Department at Sacramento City College, on their Academic Senate, and on multiple district-level committees for the Los Rios Community College District. In 2014, he was appointed by the Academic Senate for California Community Colleges (ASCCC) to serve as the statewide representative for English faculty on the Common Assessment Initiative, and he currently serves on the Faculty Association for California Community College’s Legislation and Advocacy Committee. Josh first joined LFM in 2018 as a member of Sacramento City College’s Guided Pathways team. In 2019, he will continue his involvement with LFM by moving into a coaching role and joining the LFM coaching team. Chris Smith, a former LFM participant, has been teaching biology at College of San Mateo since 2006 and became a full-time instructor in 2011. He joined the LFM coaching team in 2018. As part of a faculty team, he was awarded a District Chancellor’s grant to explore approaches to online education, and subsequently, he presented his research on online social activity and group work at California Community Colleges Online Teaching Conference as well as at the American Association for the Advancement of Science. Chris has also been a regular attendee at the ASCCC institutes on Online Education, Curriculum, Continuing Technical Education, Biotechnology, C-ID teams, and Accreditation. As a middle leader at MJC, Rob has served on the Academic Senate Executive team, as Co-Chair of the Instruction Counsel, chair of the Equivalency Committee, chair of the Academic Standards Committee, and at the state level as the Course Identification Numbering System (C-ID) lead for Studio Arts. Over the years, Rob has been recognized for his commitment to teaching and learning earning several scholarly awards including: two National Endowment for the Humanities Institute Fellowships. The first to study South Asian culture in New Delhi, India; and the second to study Islam in Asia at the East-West Center in Honolulu, Hawaii. He also received a fellowship from the Korea Society at the Academy for Korean Studies in Seoul, South Korea; and the Dar al Islam Teachers’ Institute. Finally, he was honored with MJC’s Online Teacher of the Year award in 2016-17. Michael Takeda began his participation in LFM in 2017 as a member of the Fresno City College team, which leveraged its time and experience with the academy to begin the process of developing the Guided Pathways framework for the entire college. Using his experience at LFM, Michael is now part of the official workgroup that will manage the campus-wide implementation of Guided Pathways. He has led the charge for pre-collegiate course acceleration, including membership on the FCC Pilot team for the RP Group’s Multiple Measures Assessment Project (MMAP) and Common Assessment Initiative. In addition to his academic responsibilities at Fresno City College, Michael has co-organized a series of annual events to celebrate Asian culture, In his current role as President of the Asian American Faculty and Staff Association, he has fought for the disaggregation of demographic identifiers for Asian students, and founded events to celebrate achievements and connect the campus to the community. Tabitha Villalba began her career as a writing tutor and teaching assistant at California State University, Fresno. She continued her career as an adjunct English instructor at several different community colleges in the San Joaquin Valley before becoming the Writing and Reading Center Coordinator for Fresno City College in 2008.
serving in various leadership roles on campus including Program Review Coordinator and Academic Senate President before accepting an Interim Dean’s position in the Humanities Division. She was also President of the Association of Colleges for Tutoring and Learning Assistance 2014-2016. She holds a Bachelor of Arts in English and a Master of Fine Arts in Creative Writing. Tabitha is a former LFM participant and has been a coaching for Leading from the Middle since 2018. After spending more than 10 years working with TRIO, Diva then worked as a Hub Director for the Biotechnology Center — housed at Ventura College and funded through the California Economic Workforce and Development Department. Diva also served as a Title V HSI Grant Director and Director of Student Support at Cañada College and continues to work as a collaborator and community-building instrument of change. She also continues to use data, data storytelling and data analysis as tools to guide her work and the design and implementation of programs and services that positively impact student success. Robyn Wornall first participated in Leading from the Middle as a member of the Napa Valley College (NVC) team, focused on Guided Pathways. She has served as the Accreditation Liaison Officer since 2013 and was recently appointed to serve as the project manager coordinating NVC’s Guided Pathways implementation efforts. Robyn is a graduate of the Asilomar Leadership Skills Seminar (sponsored by the Community College League of California) and NVC’s (home-grown) Leadership Academy. She appreciates the opportunity that LFM provides for refining and applying individual leadership skills in the context of a team with shared responsibility for effecting institutional change. She looks forward to sharing the unique LFM experience with others. Early in his career, he began working as a research analyst, and ultimately became Director of Research and then Dean of Institutional Effectiveness, Research, and Planning at Crafton Hills College. While at Crafton, Keith worked with faculty to implement a well-received student learning outcomes assessment process. He has also has received commendations and awards in data collection and dissemination, research, and planning. He has served on the RP Group Board, facilitated 3CSN workshops, and has been a member of the Chancellor’s Office IEPI Technical Assistance Team since 2015. Rebecca Wong has been with Leading from the Middle since its inception in 2013. She is a Steering Committee member, facilitator, and lead curriculum developer for the program. She has served as a Chapter I Resource Specialist; has helped develop and evaluate programs designed to improve proficiency in Language Arts and mathematics; and has coordinated the University and College Opportunity Program, assisting underrepresented students in enrolling in 4-year institutions after high school graduation. Rebecca has served as chair of the Mathematics Department and as the Division Chair of the Science/Math division at West Valley College and is currently the director of its Title III grant. As an active leader in her community, she also serves on the East Side Union High School District Education Foundation Board, supporting the needs of the ESUHSD community. Ben Gamboa began his participation in Leading from the Middle as a member of the LFM Crafton Hills College team. Subsequently, he became an LFM coach and is now the Research Lead and a member of the Steering Committee. Fascinated with effective and transformational leadership, Ben has led several transformative efforts, including integrating instructional and student services career-related programs into a new single cross-functional team, developing sustainable efforts to promote equity-mindedness, revitalizing staff participation in college governance, designing campus processes in support of undocumented students, and collaborating on a professional development program for aspiring future faculty members. Previously, Ben served in appointed and elected leadership roles for a labor organization, where he led outreach efforts for six years — communicating the organization’s message to its quarter-million members and the California electorate. Outside of higher education, he has served on the San Bernardino City Workforce Investment Board delivering job training programs and successful job placements to thousands of unemployed residents. After “graduating” from LFM’s first academy in 2013, Debra Polak continued her involvement with LFM, and currently serves as an LFM coach and facilitator. Debra also served as the first Basic Skills coordinator at Mendocino College; was involved in organizing union affiliation for full-time faculty; served as Curriculum Committee Chair; and as Dean of Instruction and Dean of Centers, where she led the establishment of the new Center on the Mendocino Coast, previously under College of the Redwoods. Around the same time that she assumed this role, Debra was appointed to Interim Vice President of Academic Affairs. In this position, Polak was a part of the Education Master Plan, the implementation of new Accreditation standards and Guided Pathways. Phyllis Braxton is an Associate Professor of Counseling at Los Angeles Trade Technical College where she provides advising and counseling to students enrolled in the Health and Related Sciences Pathway. She recently received her doctorate in Higher Education Leadership at California Lutheran University. Associate Dean of the Extended Opportunity Programs and Services and Dean of Counseling and Matriculation at Pierce College; and Chief Student Services Officer at West Los Angeles College and Los Angeles Harbor College. Phyllis has been extensively involved in leading student success and equity efforts such as developing college success curriculum; creating first-year experience programs; developing assessment and placement models; and conducting program review and assessment of student learning outcomes for both academic affairs and student services. Currently, she is involved with the California Community College Success Network (3CSN), the RP Group’s Strengthening Student Success Conference planning and program committees, and the Partnership Resource Team (PRT) of the Institutional Effectiveness Partnership Initiative (IEPI). Phyllis began coaching for LFM in 2018. In 2019, she has joined the LFM facilitation team and the LFM evaluation team. As a passionate champion of professional learning, Dr. Cooper provides resources and training for faculty. This passion led her to work with the California Community Colleges’ Success Network (3CSN) to develop professional learning communities throughout California to train, coach, and support faculty focusing on curricular and institutional change. In 2018, Dr. Cooper joined LFM as a coach and presently serves as a co-facilitator for the program. Until recently, she taught Sociology courses for West Hills Coalinga where she experienced first-hand the many challenges of community college students. She holds a BS in Sociology from Judson College, an MA in Educational Counseling, and a doctorate in Educational Leadership from California State University, Fresno. 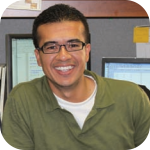 Gio Sosa is the Senior Research Analyst at Chaffey College, where he works on an array of projects relating to student success, access, and learning outcomes. His most recent work (manuscript in submission) includes an investigation into the impact of a video game intervention on the memory and cognitive abilities of adults over the age of 65. Gio recently served as the Interim Dean of Institutional Effectiveness, Research, and Planning at Crafton Hills College and as the Project Manager for the implementation of a data warehouse at San Bernardino Community College District. In his spare time, he teaches psychology classes at Cal State Fullerton. Gio is a former, 2013 LFM participant.